Written by: Rebecca Miller on October 8, 2018. The Doctor is back and in a new shiny body! As you, dear readers might remember, my misgivings at the choice of new Doctors. A lot of it stemmed from my genuine dislike of the choice of the Doctor: Jodie Whittaker. My only point of reference with Jodi Whittaker was Broadchurch and I really disliked her in that series. I have to say that I have been pleasantly surprised by how good a job she did! She did an excellent job of channeling the Doctor, but it could be the new direction and writing or just the whole new cast of Doctor and companions or even the new music, it feels like a totally different show. I show I enjoy, but not the same show. It will be interesting to see where it goes. The show gets off to a start, not with a bang, but with a bicycle and introductions to a blended family: Grace, her grandson Ryan, and her husband Graham (not Ryan’s grandad). Ryan suffers from dyspraxia, problems with balance and coordination that have made riding a bicycle nearly impossible, even into early adulthood. Falling off over and over, Ryan lets his frustration get the better of him and he chucks the bicycle down over the side of the bluff. After Grace and Graham leave to catch their train, Ryan goes to look for the bicycle, which has gotten itself stuck in a tree. Trying to figure out how to get it unstuck, he is confronted with a glowing series of squares and a golden round thing, that looks a lot like a button, which of course, he pushes. Next, he is confronted with a giant Hershey kiss, well, a giant thing that looks like an eggplant crossed with a Hershey kiss, which of course, is alien. Which, in turn he notifies the police about and the police officer, who shows up, just happens to be an old friend from elementary school, Yazmin Khan, or to her friends Yaz. And here, the stage is set for the rollicking next hour and half to two hours of excitement. The monster of the week concept will be wonderful to get back to. Doctor Who is at it’s strongest, when you’re not bogged down in yards and yards of plot. Speaking of monster, Tzim-Sha (aka. Tim Shaw), was a wonderful and absolutely creepy foil for the Doctor’s first romp. Her shocked and sarcastic verbal parries were great. 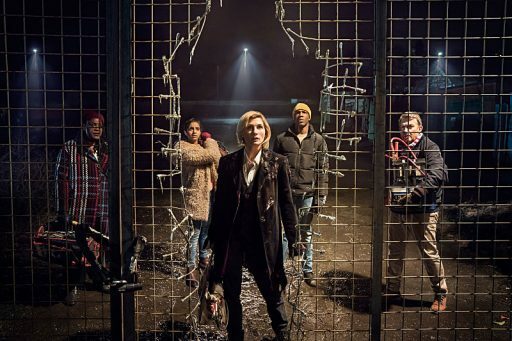 Whittaker’s Doctor channeled the kindness and smarts of Tennant’s Ten with the frenetic energy of Smith’s Eleven in a perfect melding of the two with her own twist. A much more user-friendly Doctor. I loved Capaldi’s Doctor, but he had become so sad and so dark towards the end of his run. The weight of the universe pressing him down into a bitter mass of Dark Time Lord. This compete change maybe just what is needed. It’s nice to have such a cross-section of companions! Much of the episode was so focused on Grace only to have her tearfully torn from us and from Graham and Ryan. 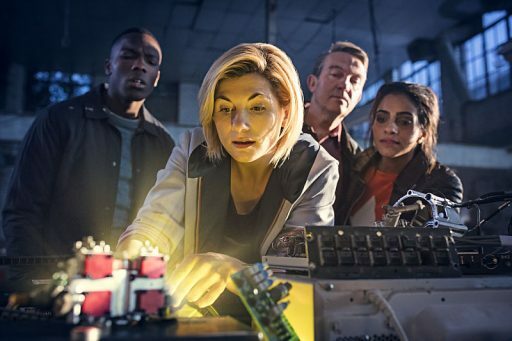 It’s nice to just have normal people as companions, Yaz, the plucky young police officer; Ryan, the little more challenged, but still very smart mechanic in training/warehouse worker; and Graham, the middle aged, retired bus driver. Just normal people from the normal city of Sheffleld, England. No place special; just a normal place. Not the Impossible Girl, not the supermodel Amy Pond and Rory Pond (Williams), or even the Chip Girl Bill. These are just normal people with normal problems. Very relatable people. Note of Who History: there haven’t been a group this big of companions since 1983 with the 5th Doctor, but not unusual, given that even the 1st Doctor had three companions from the very start: Susan, Barbara, and Ian and then later Steven Tayler with Vicki and Dodo, after Ian and Barbara left. If anything, that I think could have been done a bit better is the design of the new sonic screwdriver. Yeah. Looks a bit like something you could order from Harriet Carter, if you get my drift. We’re off to ripping start. Now, to see if they can keep this pace and this kind of writing up!